Dramatic, Fun & Oh So Jazzy! 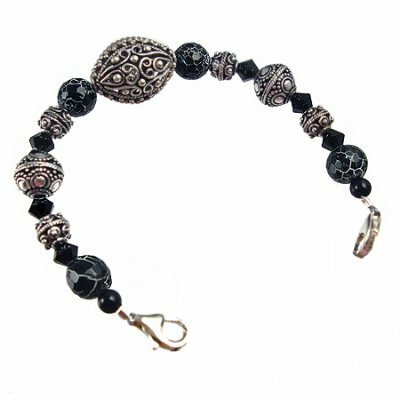 Silver plated ornate bali focal bead, 8mm fire crackle agate beads, 5mm black bicone swarovski crystals and bali silver plated spacer beads will have you wanting this design for sure! Build Your Custom Interchangeable Strand! 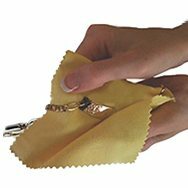 Optional Sterling or Gold Plated charm - See drop down menu below. This bracelet is VERY chunky- do not add less than one inch to your snug wrist measurement! Step 1: My wrist is 6-12"
Step 2: I add 1" to get 7-1/2"
Step 3: My Medical ID Tag is 1-1/2" which I subtract from 7-1/2" to get a Strand Size of 6". Wrist size + 1", minus Tag length = Strand Size.